Last month I loaded the kids onto the train and headed a couple of hours south for a long weekend in Byron Bay with various members of my family. It was still blistering hot, so we spent three days lazing on the sand, taking walks, cooling off in the ocean, drinking coffee, swimming in the pool, cuddling sick children, and enjoying the cool evening breezes that would come through as we headed out to grab dinner, the sun a low golden orb in the sky. 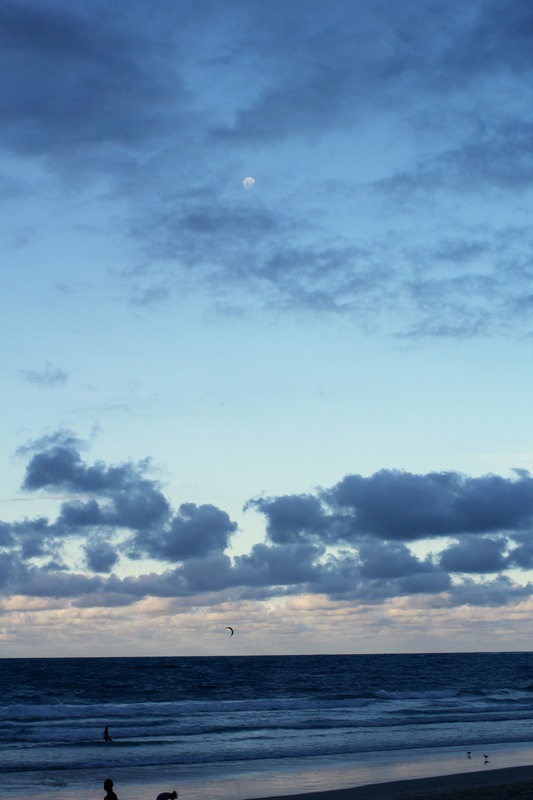 Byron Bay is the hippie capital of Australia. Clinging to one of Australia’s most picturesque coasts, the combination of a temperate climate and golden sand beaches is irresistible. That said, these days Byron is a bit of tourist mecca and can get both crowded and expensive. 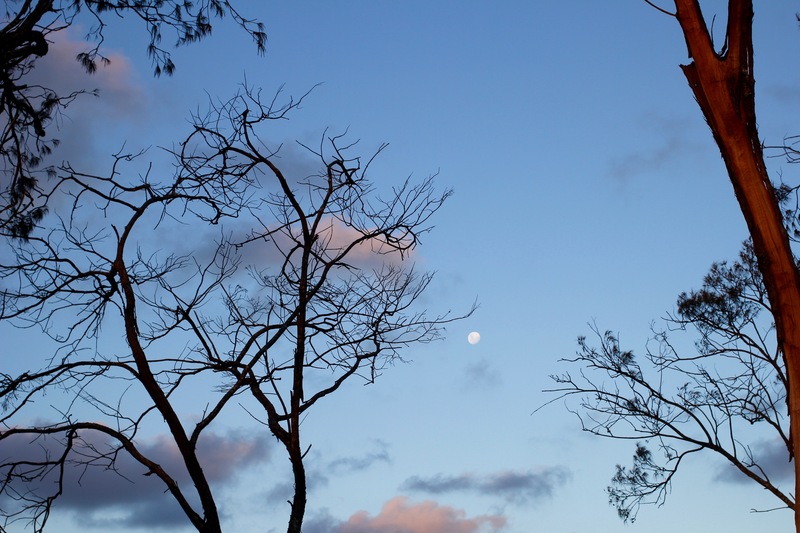 Generally, we prefer the hinterland, where the cool dark subtropical rain forest climbs along hills hiding cascading waterfalls and quaint little towns with barefoot pubs. In fact this recent trip to Byron was my first one in almost a decade. Our second night there we piled into a hole-in-the-wall Israeli restaurant. We all got falafel – that most ubiquitos of Israeli street foods – except for my (Israeli) sister-in-law, who ordered sabich. The food was all superb – piping-hot soft pita, creamy hummus, crispy falafel. And although I didn’t actually eat any of the sabich that night, it reminded me of how much I loved eating sabich when I was in Israel. It’s been a while since I was last in Israel. I was there about six years ago for a dear friend’s wedding, staying mostly in Tel Aviv. 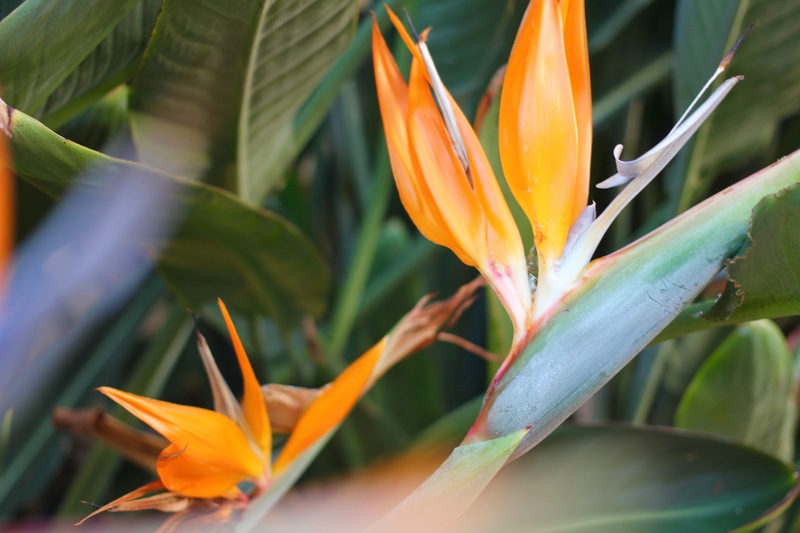 What a vibrant place – music spilling out onto the streets, frangipani trees dotting the footpaths, a beach that beats as the heart of the city. And the food! From the most amazing shuks (markets) brimming with sacks of fragrant spices, to high end sushi restaurants, to cheap local eateries where the modest entries belie the amazing array of hummus, falafel, chickpeas, salad. 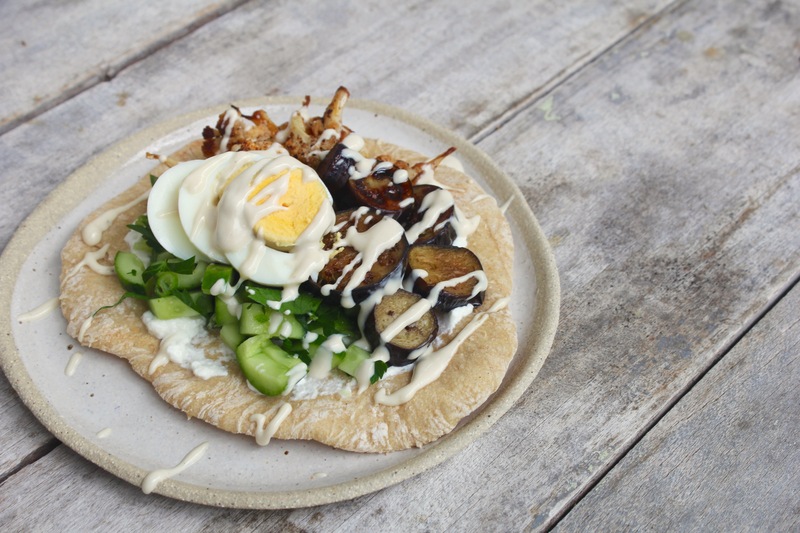 Sabich is delicious, and so simple – fried eggplant, boiled egg, Israeli salad, tahini, hummus, all stuffed into a pita. It came to Israel in the 1950s via the Iraqi Jews, and these days there are endless additions, variations – amba, schug, pickles, onion. Stalls all around Tel Aviv claim to serve the best sabich, but as long as you have the key components, it’s really a matter of taste. Whatever you do, make sure you use good fresh pita – the pillowy kind. 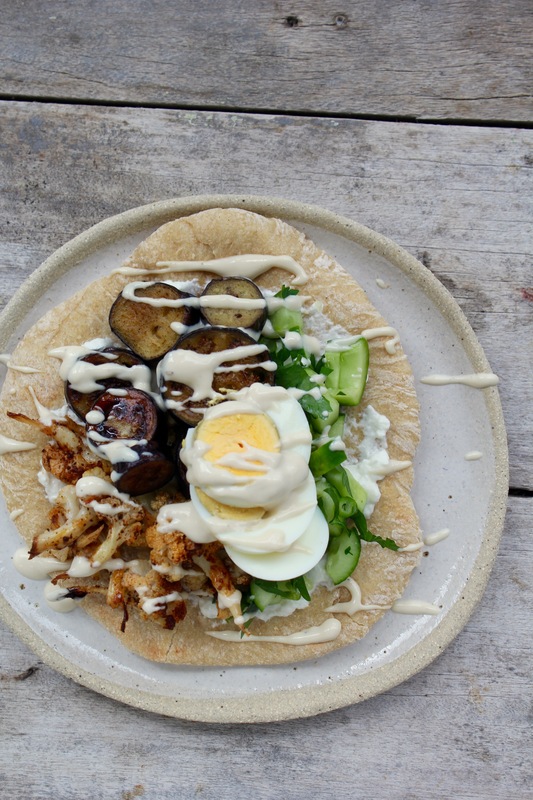 Sabich is best eaten quick and hot, preferably with tahini dripping down your knuckles. 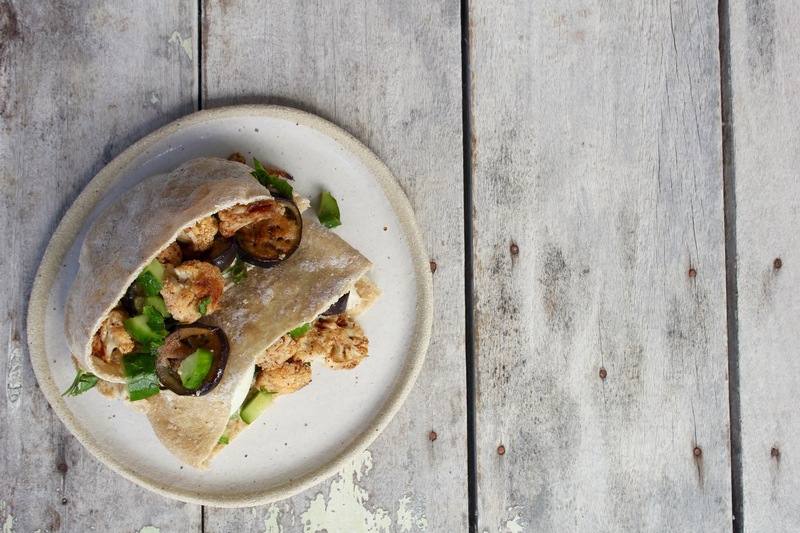 This sabich recipe isn’t strictly traditional. 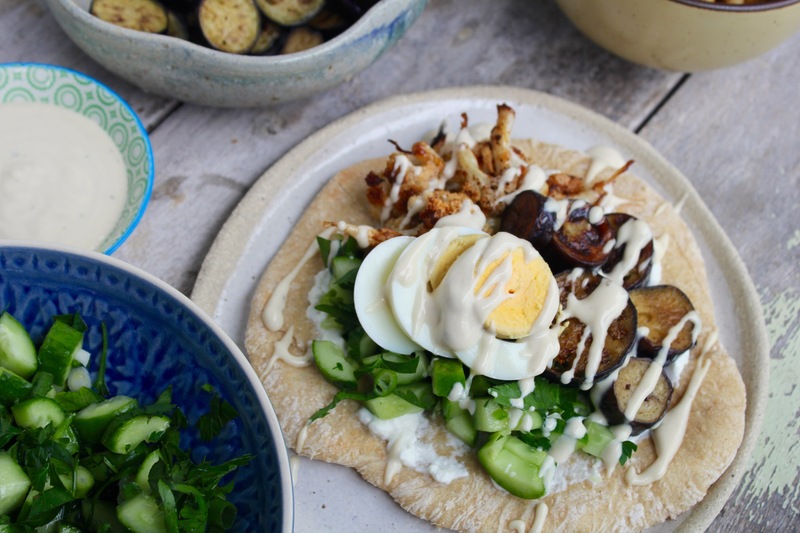 It does have all of the key elements – eggplant, egg, tahini, salad – but I’ve added and adjusted it to suit my own tastes. And I encourage you to do the same! 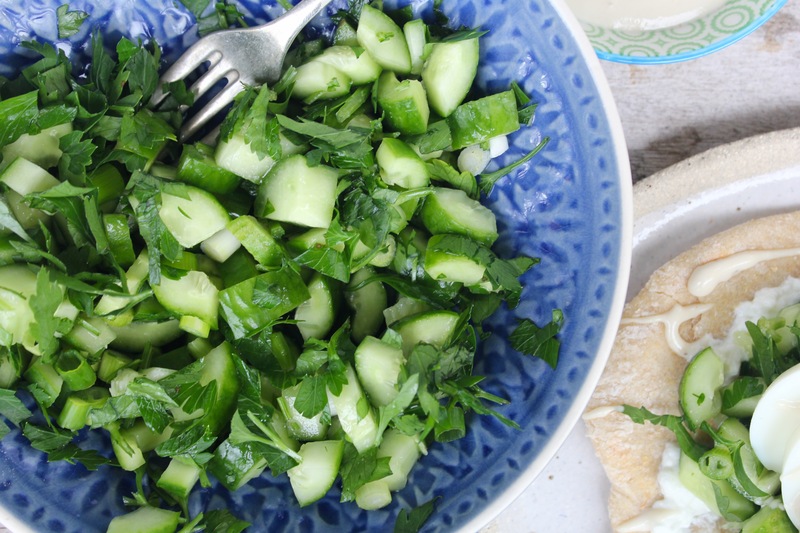 I like my sabich best served like they do on the street in Israel – stuffed into a pita – but you can also throw everything into a bowl and eat it as a salad. Cut the cauliflower florets into small (bite-sized pieces). Toss together with the paprika, sumac, salt and olive oil in a small bowl. Transfer to a baking dish, spread in a single layer, and roast in the preheated oven for approx. 25 – 30 minutes, or until the cauliflower is starting to crisp at the edges. Prepare the salad. Quarter the cucumber length ways the chop into small pieces. Finely chop the spring onion (both the white and green parts) and the parsley. Combine everything into a bowl along with the lemon juice, a small drizzle of oil and a pinch of salt. Toss to mix. Whisk together the tahini, 1 tbsp of the water, and the crushed garlic clove. If it is too thick go ahead and whisk in the extra tbsp of water. Top and tail the eggplants, then cut into thick coins (approx. 1 1/2 cm). Heat the sunflower oil in a shallow pan over a medium heat, until hot through. Add the eggplant coins in a single layer, frying for 2 – 3 minutes each side, or until golden and cooked through. Continue cooking in batches until all of the eggplant is fried. Transfer to a paper-lined plate. To assemble, cut each pita in half so the pocket gapes open. 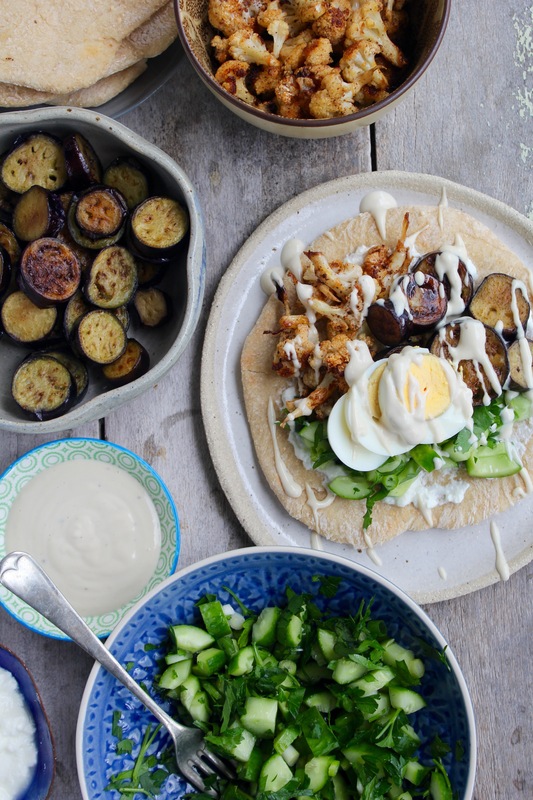 Lay everything out on a table – the salad, the tahini sauce, the fried eggplant, the roasted cauliflower, the goats cheese, the sliced eggs, and any extras. Encourage everyone to prepare their own sabich! 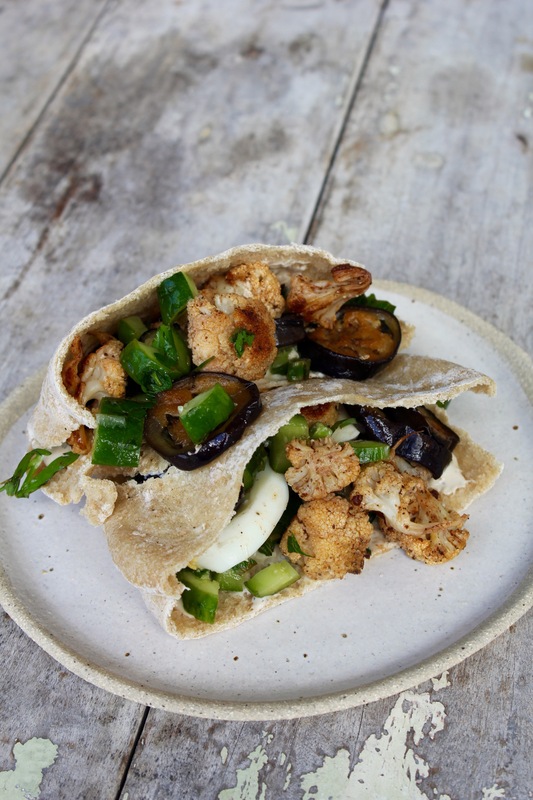 Spread each half with goats cheese, then stuff in eggplant, egg, cauliflower, salad and drizzle generously with tahini. Eat immediately! Ooh lovely!!! pass it this way please!